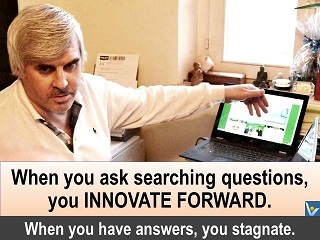 If you want to make a difference, innovate and create much higher value, question everything, ask a lot of searching questions. ❶ What are your personal long-term and short-term goals? ❷ What specific objectives must you meet in the next period of time? ❸ How will you measure success towards your goals and what feedback do you have to check your results against your goals? ❹ What new initiatives could I take to achieve beyond my current goals? ❶ What do I want to contribute? What value do I want to create? ❷ What am I told to contribute? 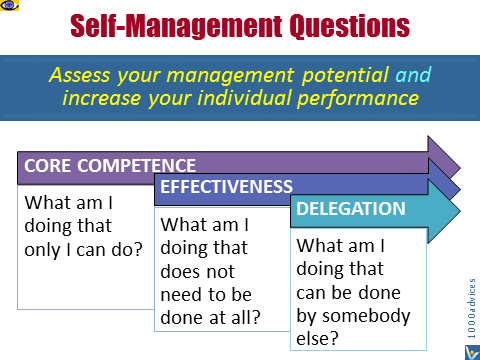 ❸ What should I contribute to achieve higher results? ❹ Where and how can I achieve breakthrough results that make a big positive difference? ❺ What qualities and abilities have I shown myself to possess? What abilities do I want to strengthen? ❻ Am I always learning forward in order to get the fullest benefit from my own strengths, while helping others to do likewise?